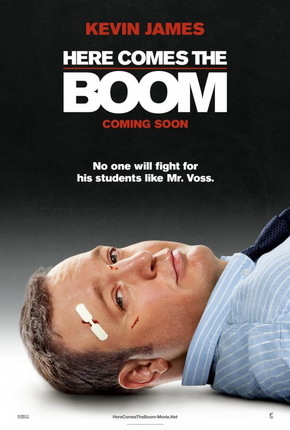 If you are looking for a fun and carefree date night movie this weekend, Here Comes the Boom is the flick for you! Jerry and I had the chance to attend a screening last night and were both totally delighted with what turned out to be a genuinely delightful and heartwarming movie. Kevin James takes the lead as a high school biology teacher who looks to become a successful mixed-martial arts fighter in an effort to raise money to prevent extra-curricular activities from being axed at his cash-strapped school. (imdb) James held his own in this film as usual, but what I loved was that every supporting character was equally strong. The comedic timing was consistent and very entertaining throughout the movie without being too silly or overdone. And if you didn’t love Henry Winkler before you see this movie, you will after you see it! Jerry is a big fan of mixed martial arts and really enjoyed the cameos throughout the movie as well as the realistic fighting scenes. No stranger to MMA myself, I found these scenes entertaining and not too gruesome to watch. The movie is rated PG because hey, there are a few pretty intense closeups of the fighting, so keep that in mind if you are thinking of taking kids. As a date movie however, BOOM brings the whole package – a heartwarming story, an underdog, comedic relief and a worthy cause. Check it out this weekend and let me know what you think!